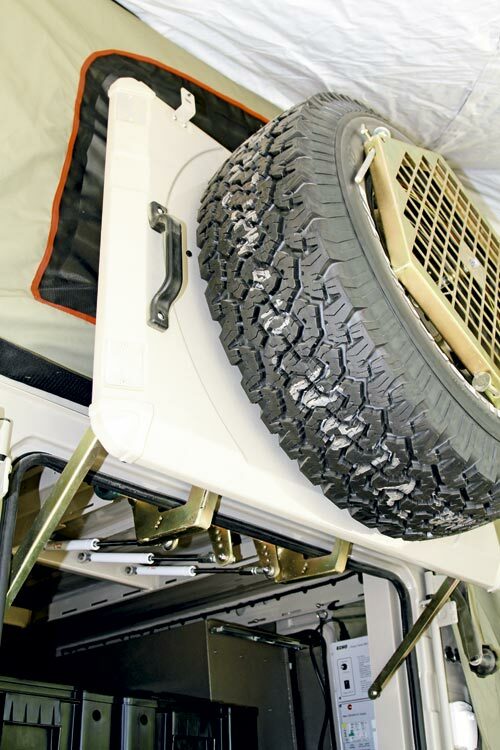 No two camper trailers from any good manufacturer are ever built alike. They evolve, shaped by their environment and the changing circumstances of the market and technology, like creatures in a pond. 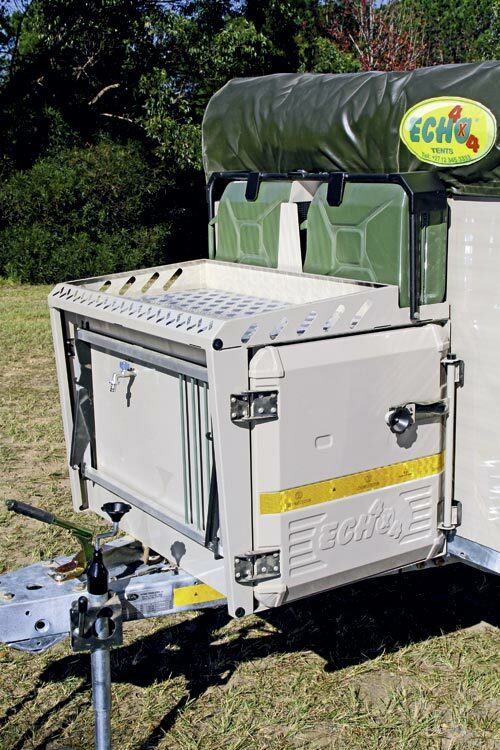 The Echo 6, the latest from Echo 4x4, is an evolutionary step up from the Echo 5 (reviewed in Camper Trailer Australia magazine #56) and opens a whole new swag of unique ideas from this South African manufacturer for the Aussie camper trailer market. 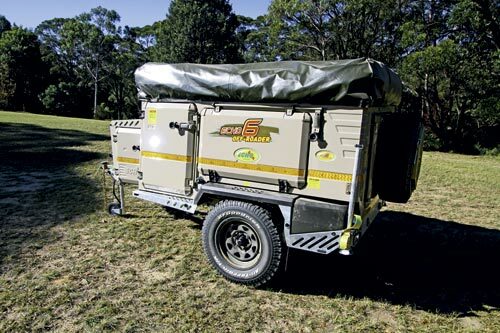 The Echo 6, like its predecessor, is a box-like unit with tonnes of carrying capacity and a roof-top style tent. 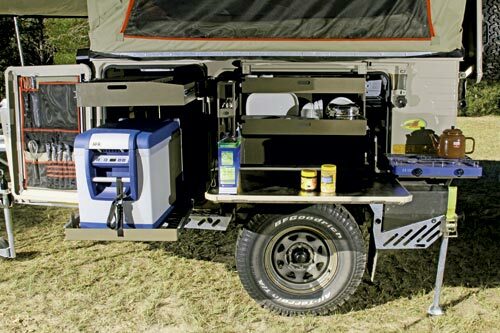 But unlike the Echo 5 or any other camper trailer I’ve seen, it has an all-steel body, stamped out of a press and spot welded together, just as your motor vehicle is manufactured. This permits a more stylish finish with greater rigidity from thinner metal, cutting approximately 200kg from the finished weight. 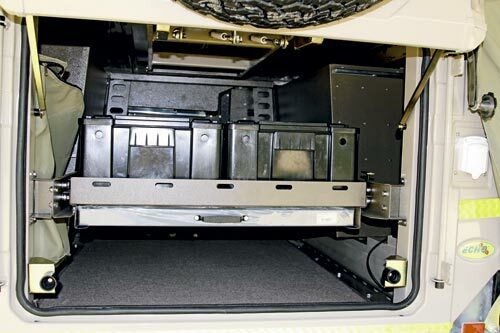 The body is completely separate from the chassis and can be unbolted and removed. It is coated in a custom-developed, environmentally-friendly Dulux paint, which is claimed to have 400 per cent greater resistance to scratching and other damage compared to standard automotive finishes. Robots weld the fully hot-dipped galvanised chassis from laser-cut components at Echo 4x4’s South African manufacturing facility. The painted trailer arrives in Australia without suspension, running gear, hitch or gas plumbing, and is fitted with local components including eight-leaf Al-Ko springs on a 50mm Vehicle Components beam axle with parallel bearings and a DO35 coupling. 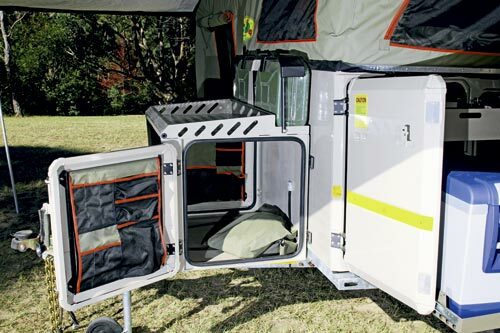 The shell is assembled locally to customer specification from modular units for greater layout flexibility, which makes it suitable for tradesmen, emergency services, military operations, animal transport and camping. 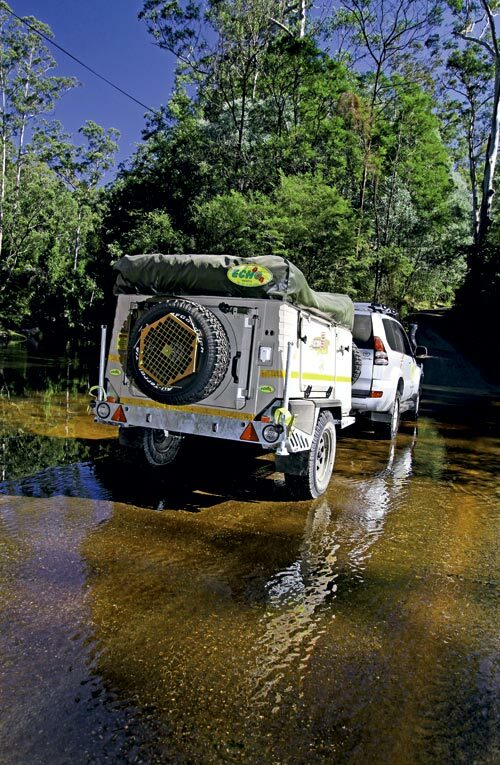 We were, of course, keen to examine its performance at camp, and put the fully-equipped version through its paces. Our trailer was set up with an offside kitchen. 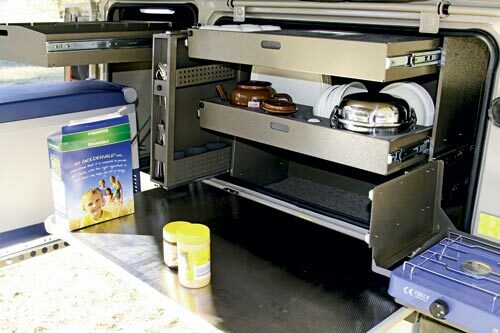 The bench folds down from the side, revealing two large pull-out plastic drawers fitted with foam for included accessories like the melamine plastic crockery and glassware for six, cooking pans and a kettle. 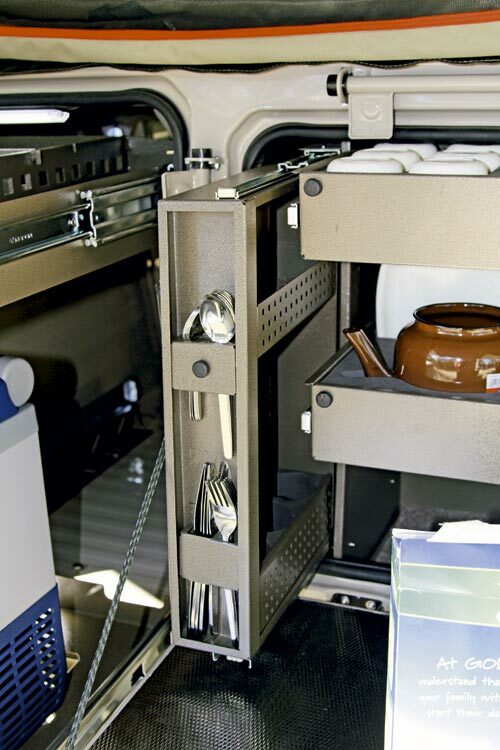 The slide-out vertical shelving unit to the left holds the included cutlery at the front with shelving along the sides for small containers. At the rear side of the relatively compact kitchen bench is a fold-over shelf for the small two-burner cooker. We had to connect the cooker to the neighbouring gas bottle in a small side locker during our campsite assessment but we were told this set-up will change on production models. At the front side of the kitchen is a large fridge slide, suitable for an 80L Engel. 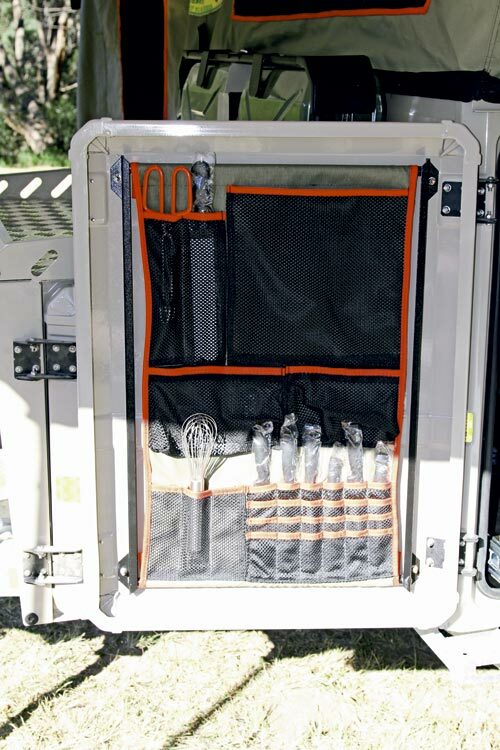 All the included cooking utensils travel in a canvas hanging unit on the inner side of the fridge access door. 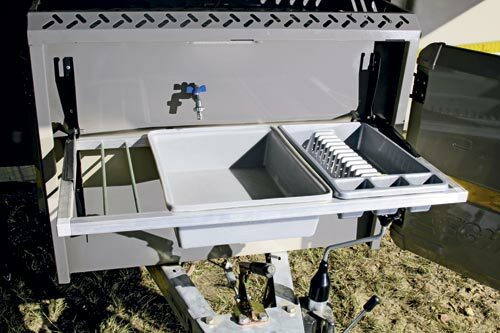 The sink and drainer are above the drawbar of the trailer. A removable frame locks onto mounting points on the front box and the plastic sink and drainer unit drop into place. A tap — with hot water if desired — is permanently fixed to the box above. 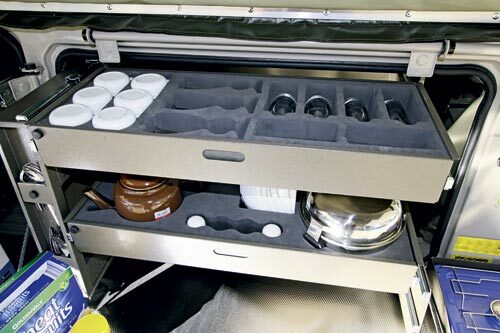 It’s a distance from the main food preparation area and I feel the projecting drawbar underneath could become a nuisance to negotiate on a long trip. 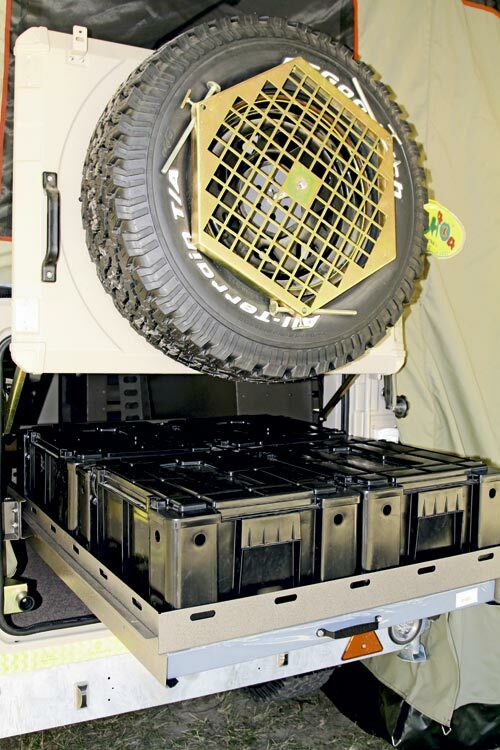 The front box can be equipped with a second fridge slide if needed, used as a generator store, or for carrying all manner of items. 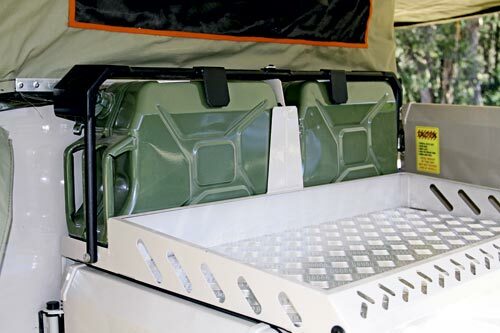 There is a carrying rack on top, with tie down points, and storage for two jerry cans at the back. To access the interior, the rear door of the body lifts on a cantilevered hinge arrangement, assisted by a neatly engineered set-up of three gas struts inside. It is easy to lift, despite the spare and a barbecue grill being mounted there. The internal body can remain empty if you’re happy to sleep on the floor, but I felt the roof-top bed was much more practical. 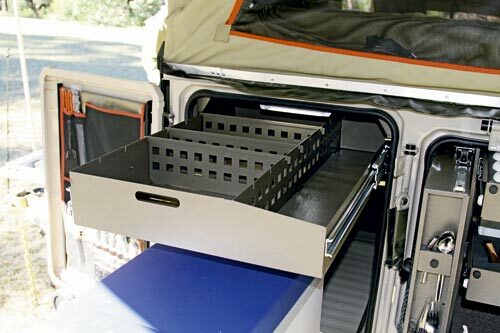 The review model had a large slide-out drawer in the middle which was the length of the trailer’s interior. On the left there was a laundry bag and on the right, the tidy electronics set-up. 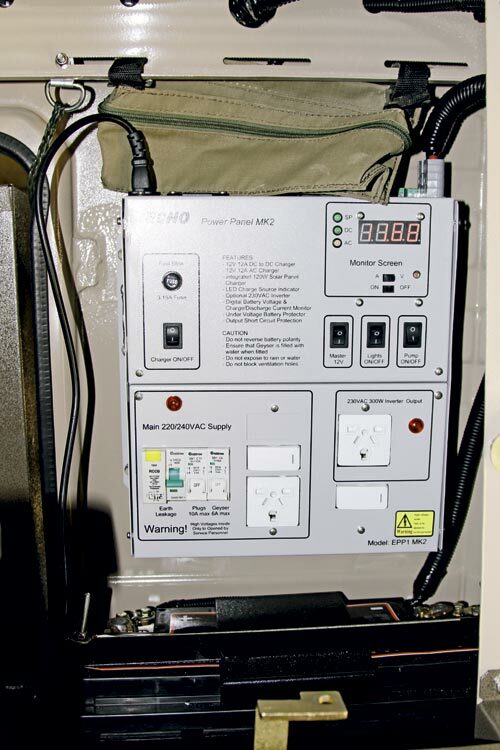 This clever, single plug-in box incorporates a 14A DC-DC charger; 150W solar regulator; 300W pure sine-wave inverter operating through the RCD safety switch, featuring a fast-blow fuse; battery protection; output short-circuit protection; an LCD Volt and Amp display and a 240V outlet. The unit was designed in South Africa and has been tested in Australia to ensure compliance. 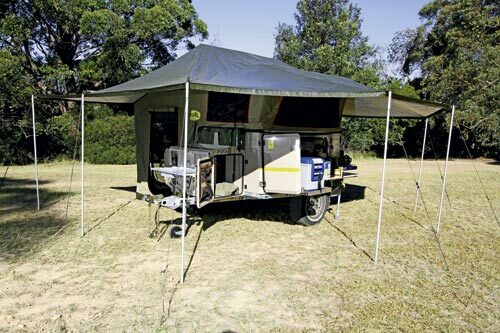 The tent folds off the top of the trailer and drops 1550mm to the ground with slightly baggy walls for camping on uneven ground. 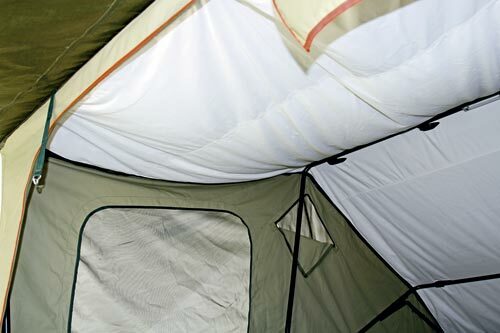 It has a higher roof and pitch than the Echo 5, and is also equipped with a linen condensation liner in the roof, and two large vents near the peak. The bed is slightly larger in size than a queen at 1500x2200mm, with a high density foam mattress. Access is via a reasonably steep six-step ladder, and there are large screened windows all round. Protruding into the main 2200x2200mm floor area, you’ll find a fold-down bench, equivalent in size to the kitchen’s, plus two sets of optional drawers for clothing, a vertical cosmetics unit and a coat hanging space at the front. 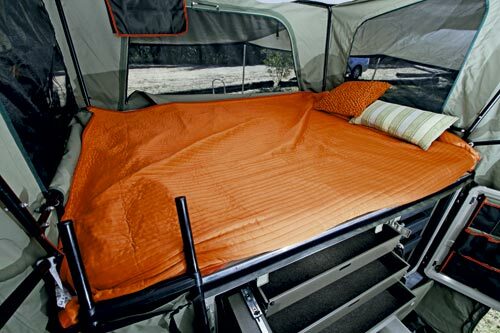 The permanently fitted 360º awning is a standout in the Echo 6. This gives a huge 6200x7200mm covered area, and with our fully optioned trailer were a full set of walls to completely enclose it with hook and loop fasteners under the awning rim. 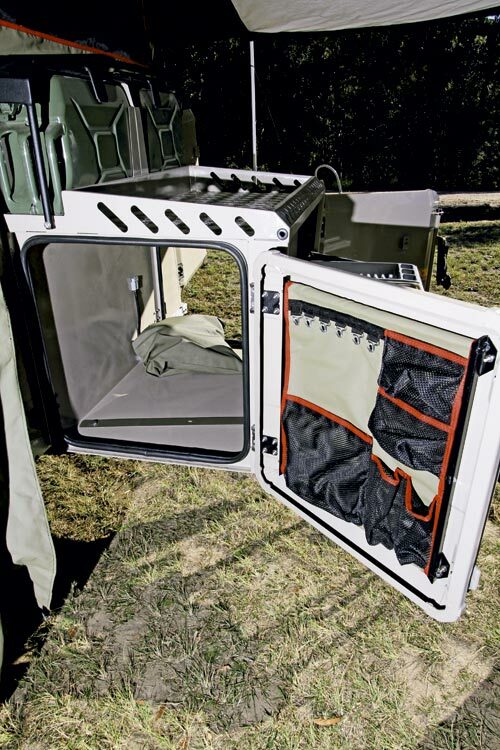 Also available is the optional shower tent which hook and loop fastens on to the front wall of the tent under the awning. The shower feeds direct from the tank or an optional gas hot water unit. The unit — not fitted to our trailer — heats instantly and requires no reserve tank. Despite its huge size, the whole set-up (without walls) took the two of us just 16 minutes, and nine minutes to pack away. 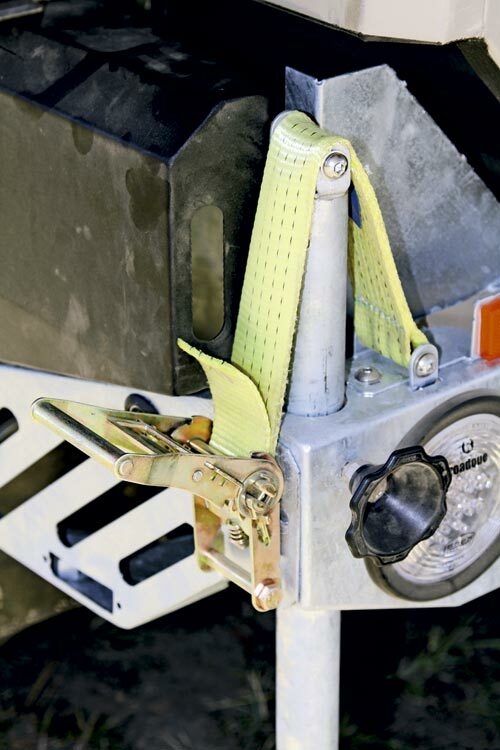 The trailer bristles with features, which we don’t have room to fully cover, like six high-lift jack points, two rear stabilisers with ratchet straps capable of actually lifting each side’s wheel off the ground and an optional second room for three more. 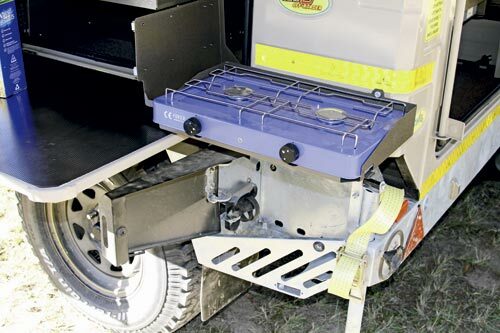 When you close the camper you can hear the pinchweld seals with camlock fasteners expel air as they compress, plus there is the Stone Stomper stoneguard, fully-welded vinyl seams and much more. 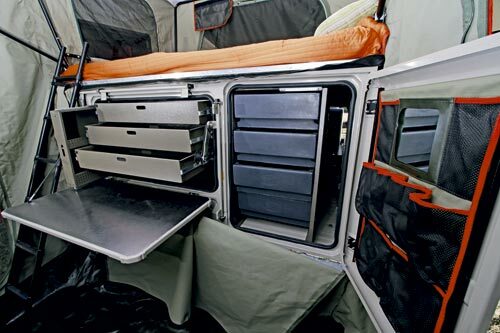 The Echo 6 is an attractive camper with many neat, well thought-out features for a competitive price. 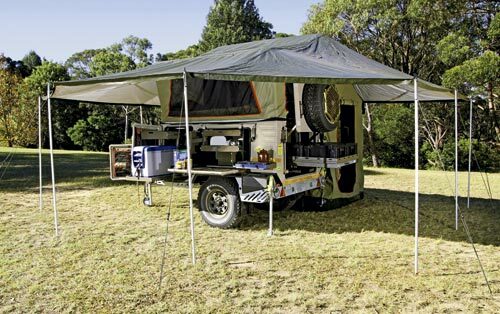 The unit is tough, has a huge payload and carrying capacity and the stunning 360° awning makes it fast and easy set up and pack down. At $31,990 as shown, the Echo 6 is a luxury item that offers outstanding value for money. Well worth a look. 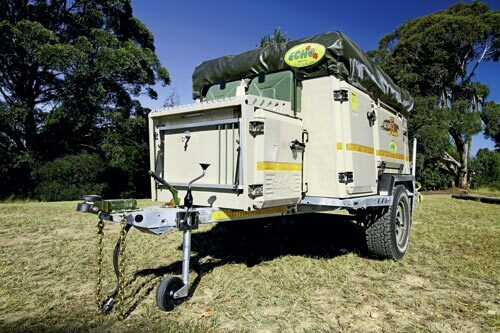 Find Echo camper trailers for sale. 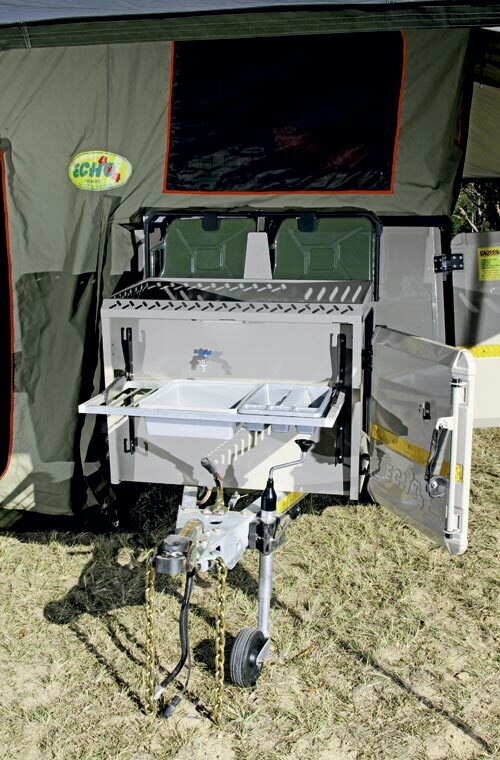 Search for new Echo camper trailers.